Official Firmware 5.51: hidden so this minor update? It is always fun to hunt at a new minor upgrade Firmware of the PSP since Sony never does this. While much can hide this new version 5.51 firmware from Sony? The arrival of the official firmware 5.51 Sony had no indication of change, but as you know, Sony does not update for no reason. So what is the new hidden? In fact, SONY, with firmware 5.50, had blocked the hole USER Matiaz of which could use a Tiff image to launch the chickHEN but had not filled the hole kernel Davee. In plain language, the chickHEN could run on firmware 5.50 if someone had found another flaw in a game user or in another image. A little hope for owners of PSP Official Firmware 5.50 can be reborn as a loophole to get enough users to start the chickHEN R2 on the PSP. Now, you know now that hid its next update 5.51 for Sony: a correction of flaw in the rules. The Popsloader is a plugin (extension) very useful to all lovers of the PS1 emulation on PSP and if it is not your thing, go your way. On the other hand, if you can not imagine a PSP without play PS1, although optional, it will be necessary soon. 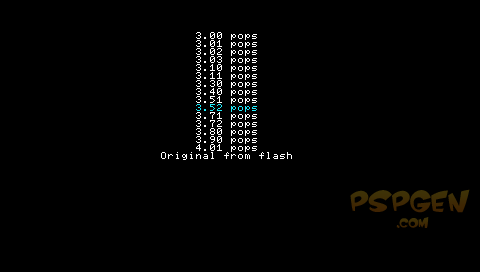 POPSLOADER for 5.50GEN is an update from GENyUS of popsloader for 5.02GEN-A of Miriam, who was an upgrade popsloader 5.00 of Dark_Alex. Please read our BIG TUTORIAL – Install and use easily POPSLOADER 5.50. Note that if you already have popsloader 5.00 installed, you can overwrite the old version by installing it.This should work without any hitch.